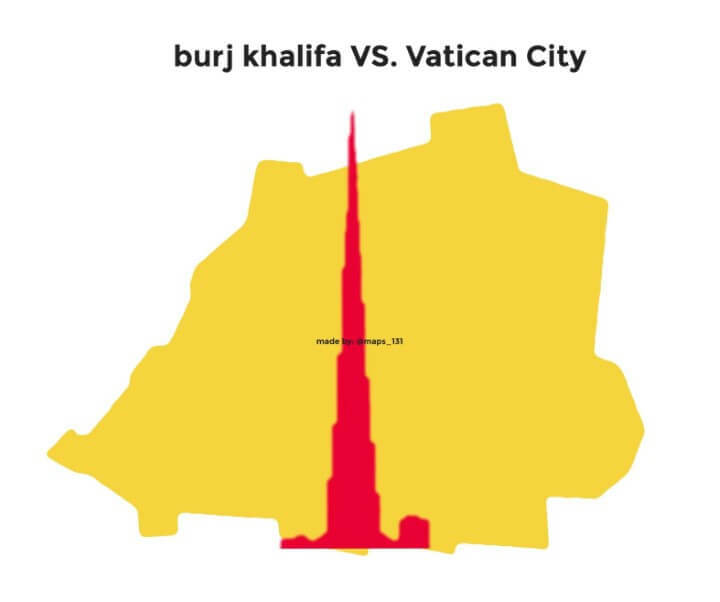 The map above shows what would happen if you lay the Burj Khalifa on its side within the Vatican City. The Burj Khalifa is world’s the tallest building at 828 m (2,717 ft), while Vatican City is the world’s smallest country in the world at just 0.44 km2 (0.17 sq mi). In terms of floor space, the Burj Khalifa has 309,473 m2 (3,331,100 sq ft) vs the Vatican’s total land area of 440,298 m2 (4,739,328 sq ft). Finally, in case you were wondering the highest point in the Vatican is St. Peter’s Basilica which 136.6 metres (448 ft) tall. This means it would take just over 6 St. Peter’s to equal the height of the Burj Khalifa.